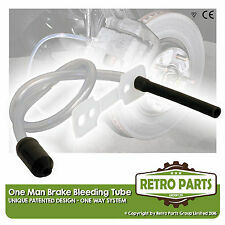 Vizibleed 'One Man' Brake & Clutch Bleeding KitNew & improved complete bleeding kit The new and improved Vizibleed 'one man' brake and clutch bleeding tool is a must have for any DIY motorist. This tool is universal and now comes complete with Eco Bottle and retaining strap designed to ensure it will not dislosge under pressure. This high quality tool features a patented one way valve as well as durable tubing and a neoprene connector. Its design not only allows you to keep a constant visual check but also means that it is simple to use and efficient.